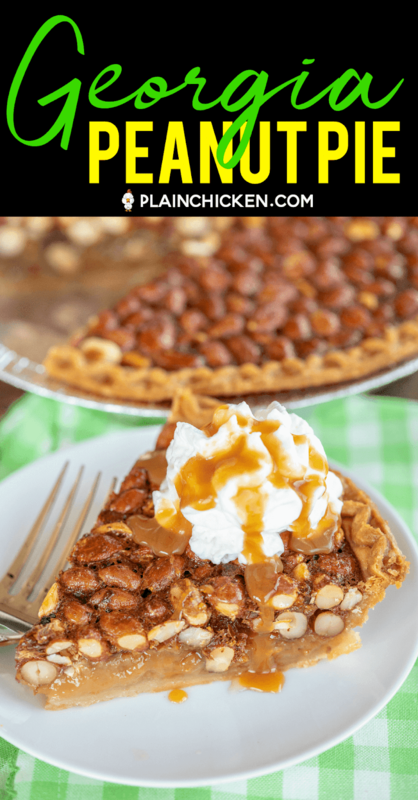 Georgia Peanut Pie - very similar to a pecan pie but with raw peanuts! SO good! This pie is SO easy to make - just whisk together eggs, vanilla, sugar and corn syrup. 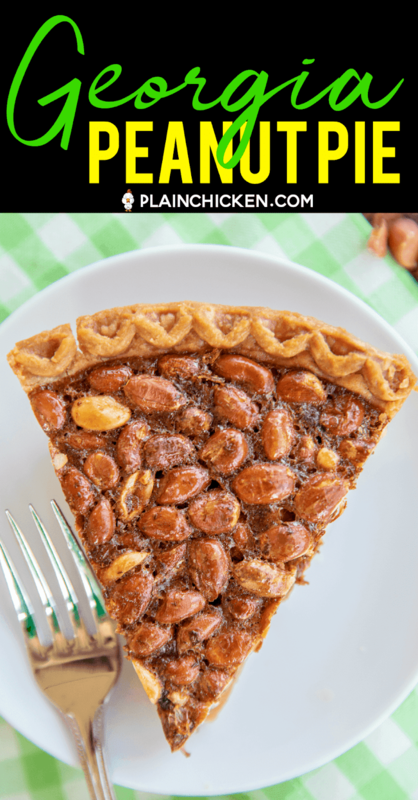 Stir in the raw peanuts and pour into a frozen deep dish pie crust. Top baked pie with some vanilla ice cream or fresh whipped cream. Can make in advance and store in an air-tight container. 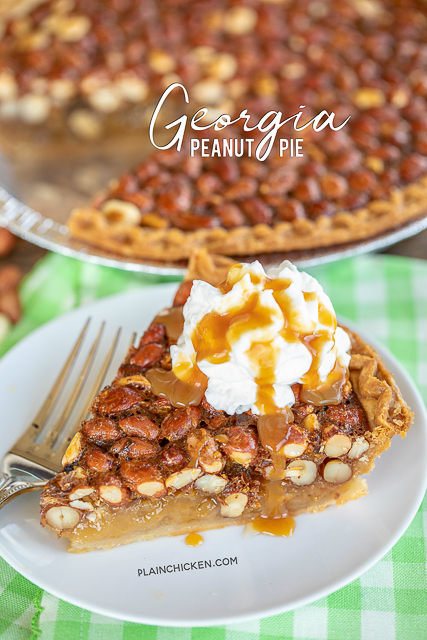 Have you ever tried a Georgia Peanut Pie? 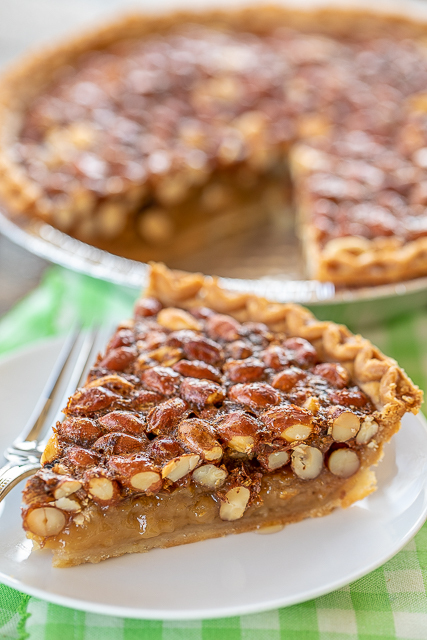 This Georgia Peanut Pie is similar to pecan pie, but it is made with raw peanuts instead of pecans. 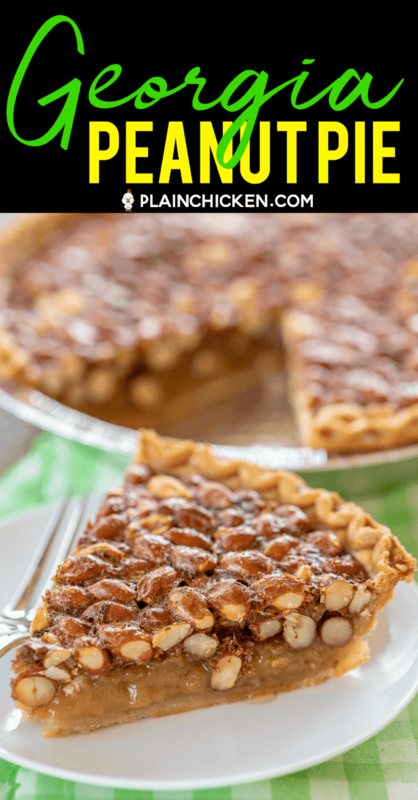 I had never heard of peanut pie until I stumbled across a recipe in an old cookbook. It sounded interesting, so I decided to give it a try! OMG! I'm so glad I did. This was delicious! We ate WAY too much of this delicious pie! 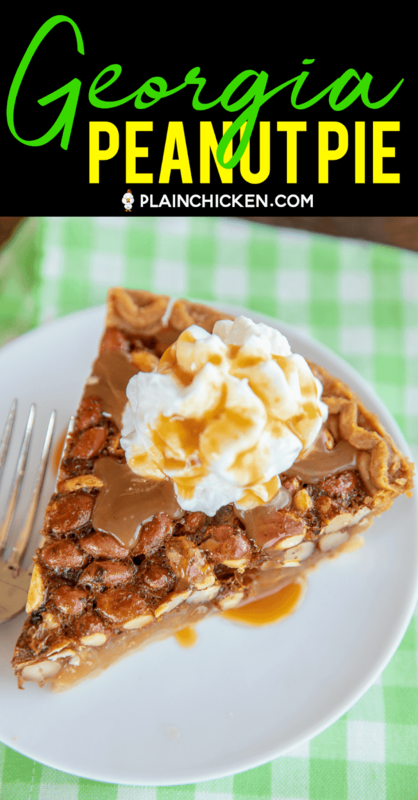 This Georgia Peanut Pie is perfect for watching The Masters and all your upcoming potlucks and dinner parties. I have it on the menu for Easter. I might make two pies because they never last long! 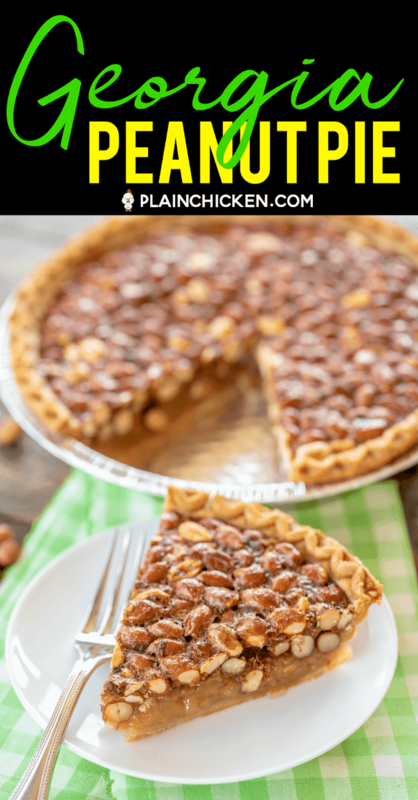 Making this Georgia Peanut Pie is very similar to making a pecan pie. Whisk together eggs, vanilla, sugar, and light corn syrup. 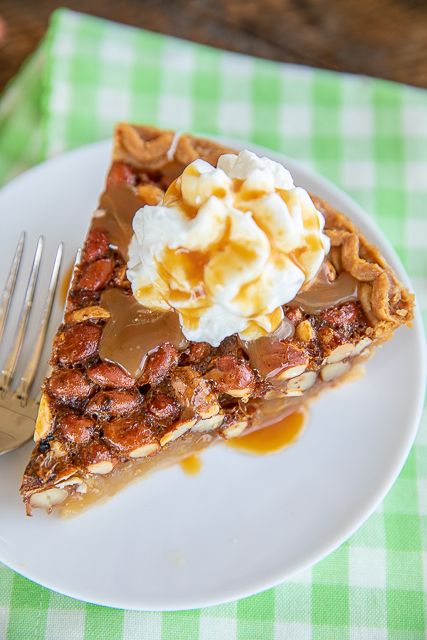 Stir in some raw Georgia peanuts and pour into a frozen deep dish pie crust. SO easy! Pop it in the oven and you are done. There is no need to thaw the pie crust before baking. It will bake along with the filling. 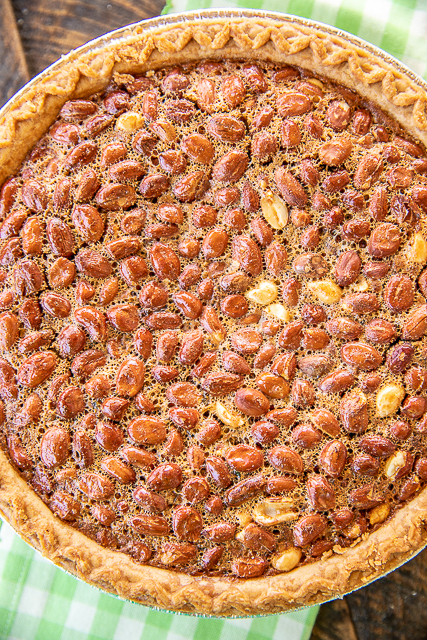 This Georgia Peanut Pie uses raw peanuts. I found the shelled raw peanuts at Walmart. I haven't made this with already cooked/roasted peanuts. I'm not sure if they would burn or not. The raw peanuts were perfect! This Georgia Peanut Pie is best served after it has had time to set up. I prefer to serve this peanut pie the day after baking. It is hard to wait that long, but it tastes so much better if you can wait. It won't be runny if you let it set up. We topped the pie with some whipped cream and caramel sauce. It is also wonderful slightly warmed with some vanilla ice cream! YUM! Can I Make the Pie in Advance? 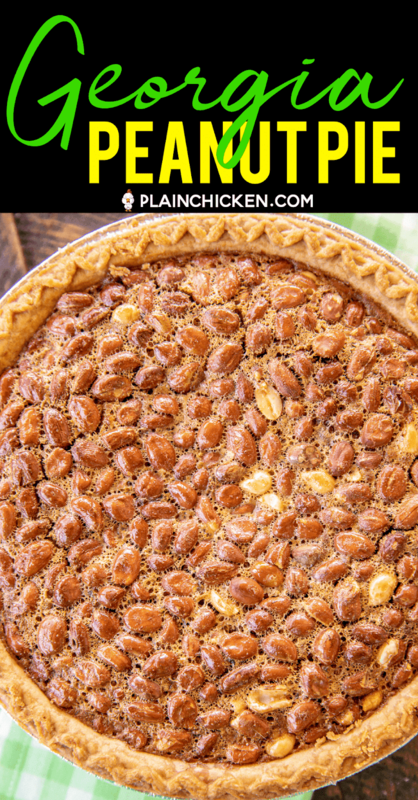 You can make this Georgia Peanut Pie in advance and store in an air-tight container. I put it in a gallon ziplock bag. It fits perfectly. I keep it on the kitchen counter. I don't refrigerate the pie. You can, but it isn't necessary. You can even freeze the cooled pie for later. Whisk together eggs, salt, vanilla, brown sugar and corn syrup. Stir in raw peanuts. Pour into unbaked pie shell. Bake for 10 minutes. Reduce oven temperature to 350ºF and bake an additional 45 to 50 minutes. 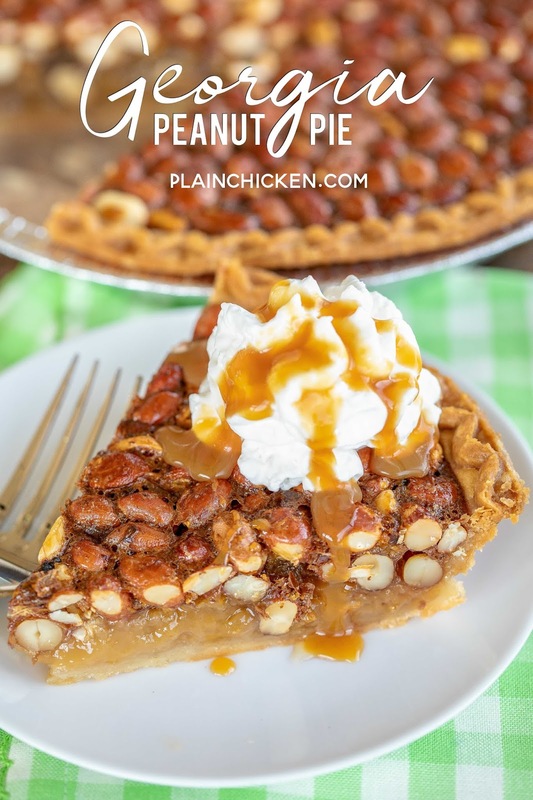 I love the filling part - i really just want to make a pecan or peanut pie and leave out the nuts - bhahahahahaha! hell leave out the pie crust - just make it a pudding!!! That would then be called a pudding puddle!!! could you use rsted p nuts ? like you get in jars ?